Giacomo Puccini. Very Good. In very good packaging. 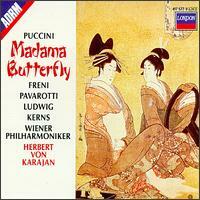 Puccini: Madama Butterfly. Fair. Wear to case Buy with confidence-Satisfaction Guaranteed! Satisfaction 100% guaranteed. Very Good OR better. Includes all 3 cds, booklet and case. All in very good condition. No box included. We can do International Shipping. Excellent service. Buy from us and help the Earth-100% of our store's power comes from green energy sources like wind, solar, and hydro!